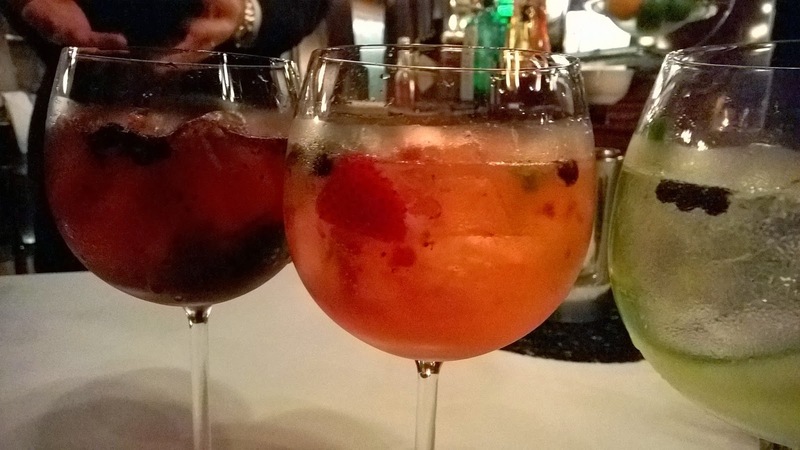 The evening starts with a drink at the Bar at Frankie's, the Italian restaurant right next to Marco Pierre White Steakhouse & Grill (MPW). 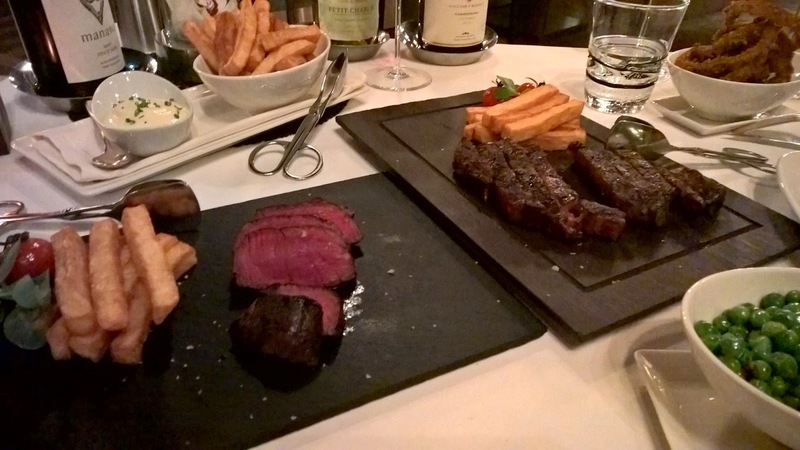 There are not many steakhouses that offer this as a concept to guests, and I love it. I have the flavour of the moment, an Aperol Spritz. 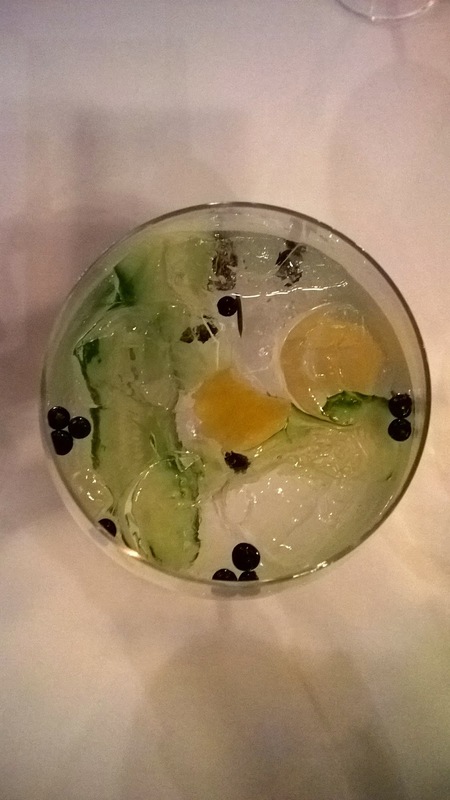 Light and refreshing, it is a drink that evokes lazy afternoons at garden parties and terrace lunches. When is about to try a new menu at a restaurant, everything seems a distraction and you simply ant time to move faster, but not tonight. My drink immerses me in the moment and I am content. 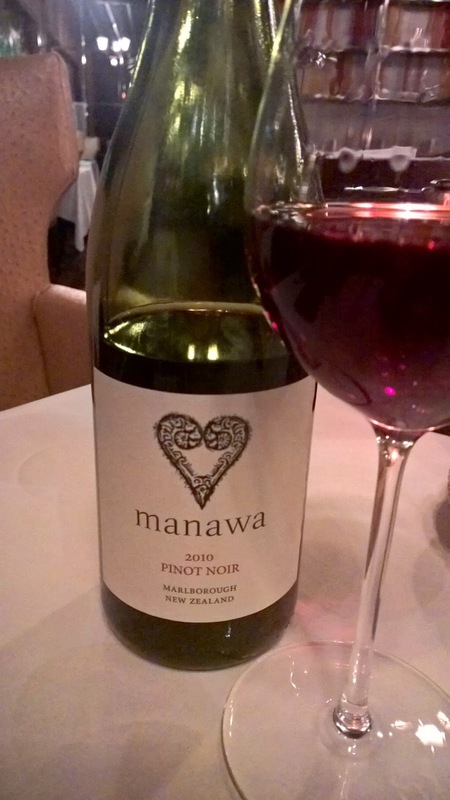 Rather than have another though, I am led to MPW. I have been here before, but still I bask in the elegance and refinement of the restaurant. Heightened levels of warmth and intimacy greet me as I am seated. What would you expect from a restaurant that caters for a maximum of around 65 guests? 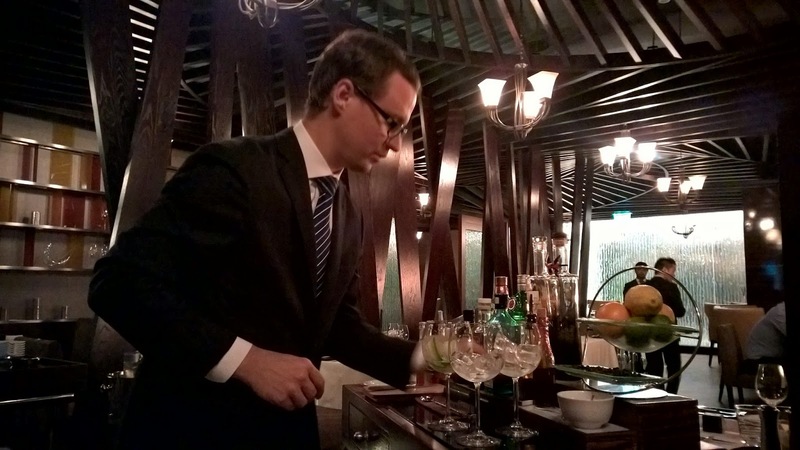 I have a penchant for theatre and drama, so when I see the Gin Trolley brought to my table, I feel my face lighten up. For me it is the most natural way to break the ice and introduce service. Rather than ask common place questions of the guest, talking about the options on the trolley makes the engagement process an effortless and real one on the part of the waiter or waitress. I sample three. Tanqueray No. TEN® and juniper berries comes first. It is very subtle but quite refreshing. Then, I try Chase Gin with strawberry and basil. I like it immediately. The aroma of basil hits me first and when I smell again, I get the strawberry. It tastes more profound than the first. Finally, Chase Gin again, but this time with mulberries. This is fruitier and sweeter. It has a deep colour and I imagine having this even on a Winter's evening in Abu Dhabi. As I am enjoying one of the Gin creations, the amuse bouche is presented. 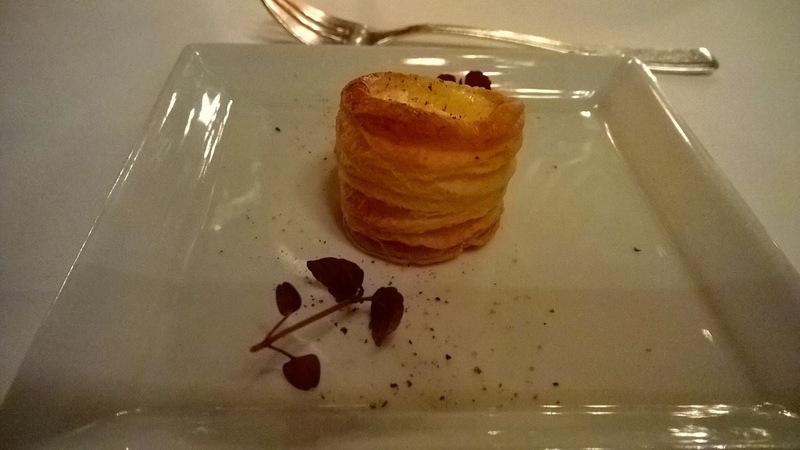 It is a puff pastry filed with cheese and black truffles. That pastry could not have been baked better - it makes a crispy sound as I bite into it and chew it. The combination of the cheese and truffle works well. 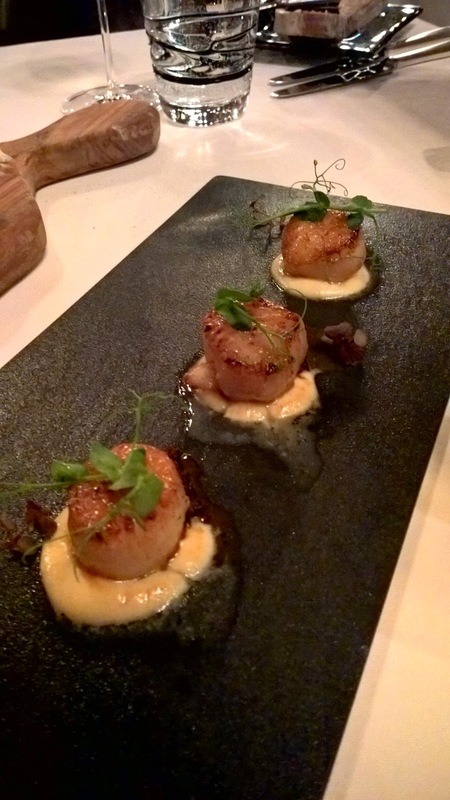 Chef decides to prepare a few tasters from the new menu, starting with the Pan seared scallops. These are beautifully cooked. I think there is often a tendency by inexperienced chefs to feel they need to over compensate for the delicate flavours inherent in scallops and overwhelm them in the process. However, tonight that is anything but the case. The scallops have retained their innocence and purity. Love. 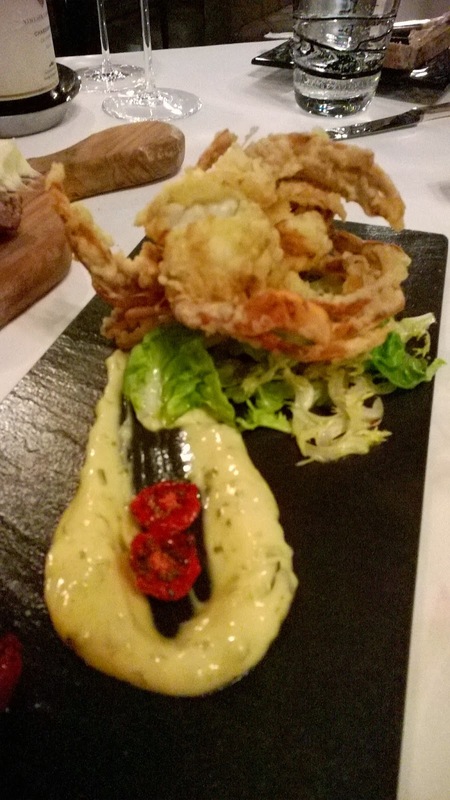 Next up, we have the Soft Shell crab - a fairly classical interpretation, but instead of fresh pieces of lemon, there is lemon aioli. Together with a perfectly cooked crab, I recognise a good dish. That crab just breaks in my mouth. Nothing chewy. Just easy. Also, the aioli is rich and generously citrusy. While I applaud steakhouses who try to be creative with their menu items, I am also immensely pleased when they stick to the classics. 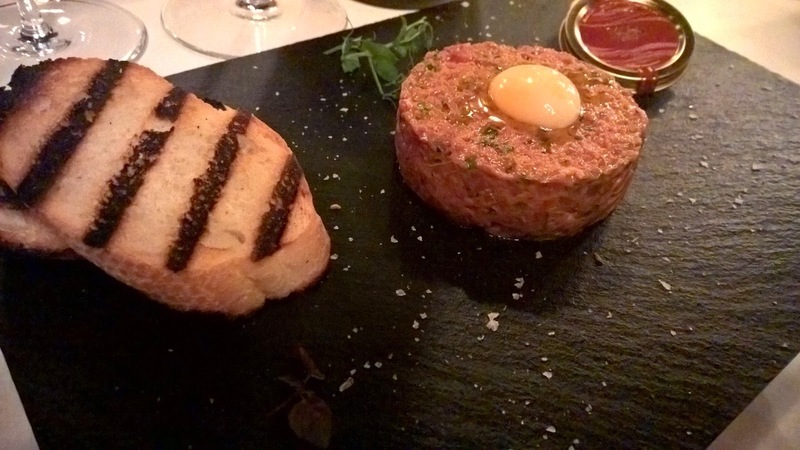 There are staples I expect when I visit a steakhouse and the beef tartare is one of them. The Angus beef tartare is exquisitely presented. I must say that I love the black slate instead of the more clinical white plates used exclusively in some quarters. Yasa caviar on the side brings a feel of luxury to the dish, but the irony is that this dish is still so affordable. I am really impressed. Affordable opulence and indulgence. 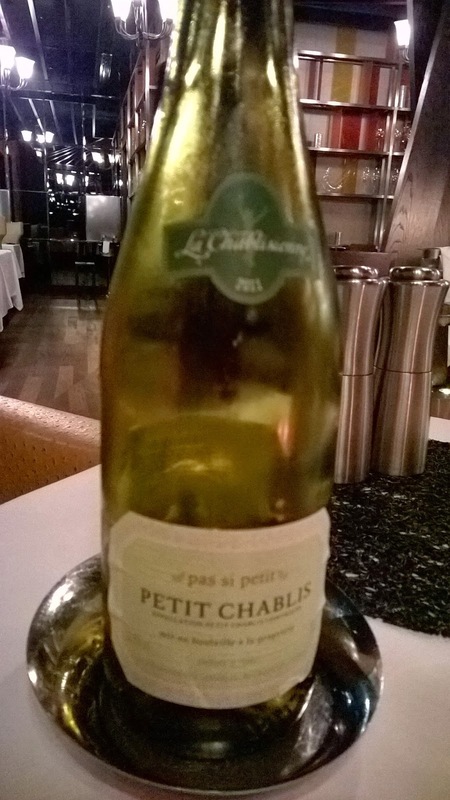 One of the enviable strengths of Marco Pierre White Steakhouse & Grill is its wine list. 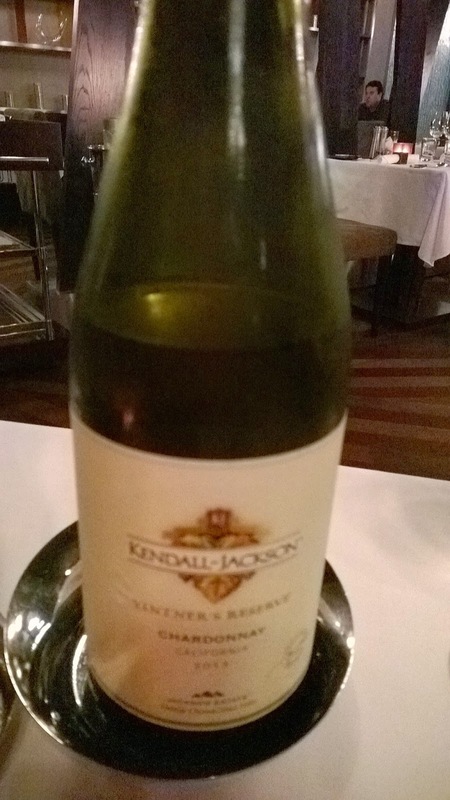 It has been awarded Two Wine Glasses or the Best of Award of Excellence by The Spectator. To quote from The Spectator: These lists typically offer 350 or more selections, along with superior presentation, and display either vintage depth, with several vertical offerings of top wines, or excellent breadth across several wine region. It is the only restaurant in the UAE to have this distinction, and one of only 800 or so restaurants world wide. This strength is made all the more emphatic by the presence of a Head sommelier who also serves as the restaurant manager - Oskar Skoog. I believe he brings something to the restaurant that not many in the city can compete with. 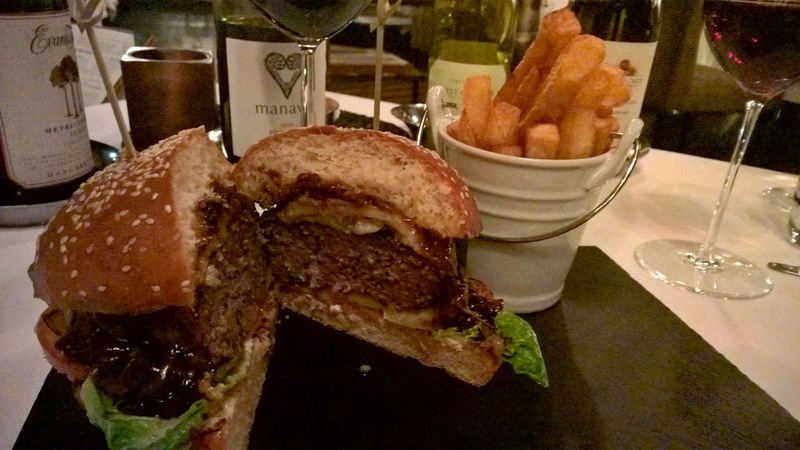 These musings are emphatically cut short when the next dish is served - an Angus beef burger. Nothing speaks greater volume of a menu that it is accessible more than a burger! It is big! I like its inclusion on the new menu. I think restaurants should be inclusive and not exclusive, while at the same time not compromising on quality. It opens up possibilities for the restaurant. Not everyone wants to sit through a 4 course meal and sometimes a guest simply wants a hearty single course! Well this burger will be just that. Moving on to the beef, the menu is impressive on so many fronts. I deplore the fact that beef, notwithstanding the fact that it has to be imported, is so expensive in Abu Dhabi. So when I see this menu, I feel reassured. The options on the new menu show the direction that MPW is heading. While they have retained the Grade 9+ and Grade 5 cuts they had previously, they have also added quite a few options in the middle. It is now possible, for example, to get three sub-200AED USDA Prime beef cuts. For a high end steakhouse, that is remarkable. 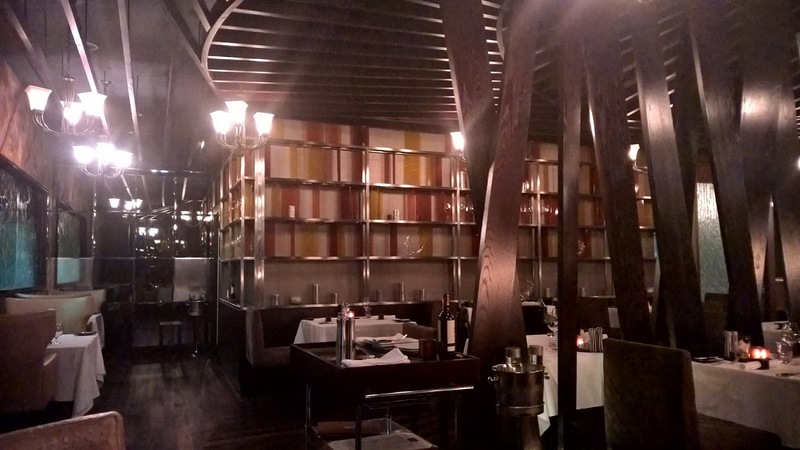 The restaurant therefore gives diners more choice, without overwhelming them. I think there is a danger that when you give too many choices, it confuses guests, but that is not the case here. 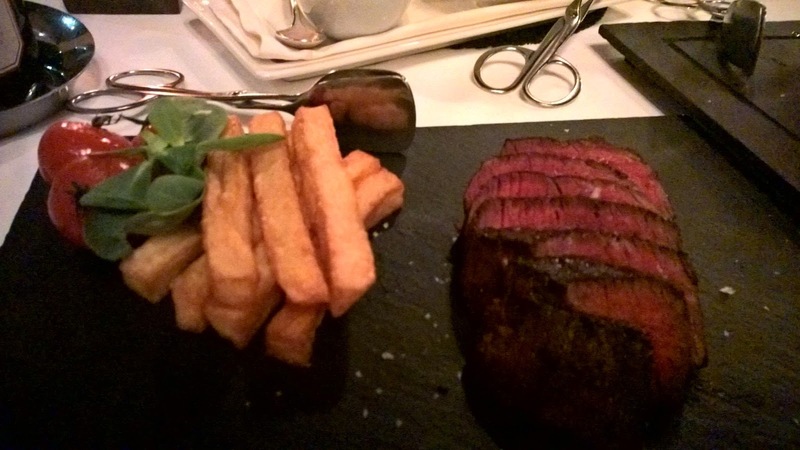 We have the Wagyu Grade 5 tenderloin and one of those options under 200AED, the Prime ribeye. They are both cooked to perfection, and I think they have done a clever job with the plating. It is really share-friendly. I am surprised not more steakhouses do this, or at least ask guests gathered around a table if they would like this as an option. 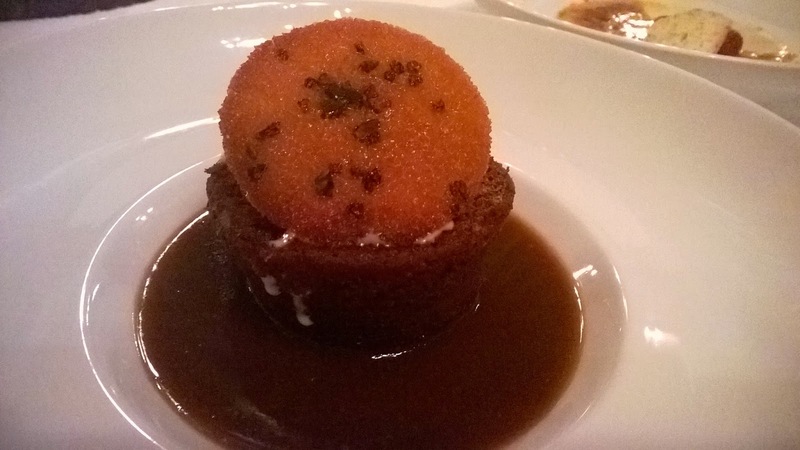 One often forgets the British roots of the restaurant, but that is corrected soon enough when I have the Sticky Toffee Pudding. I revel in it when I can smell a dish even before it is placed in front of me. Food should, I believe, engage as many senses as possible. It has a lovely texture and is deliciously sweet. To counter that sweetness, or even to enhance it depending on your perspective, it is served with vanilla ice cream. Glorious. In summary, do I think the new menu will challenge people's notion that Marco Pierre White Steakhouse & Grill is expensive and therefore not as accessible as they would like? Oh an emphatic yes! The menu shows that it is possible to dine in a fine restaurant like this and have a very affordable evening. Don't get me wrong, there is enough evidence on the menu to show that luxe is still at heart here, but it is also wallet-friendly without compromising its core philosophy. 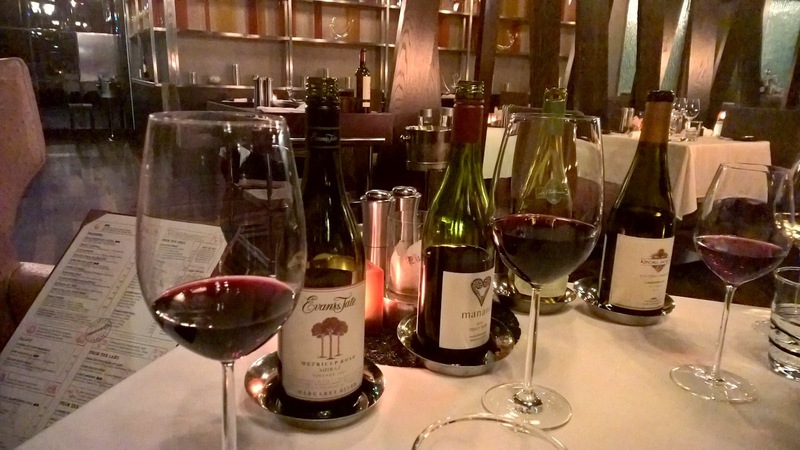 Boasting the best wine list in the UAE coupled to some magnificent new menu items, Marco Pierre White Steakhouse & Grill is now ready to reclaim the plaudits it enjoyed a couple years ago. Seriously.